NotRappaport » October 31st, 2017, 10:33 pm wrote: This ... should produce a picture that shows what "IT" actually looks like. NotRappaport » 31 Oct 2017, 12:13 wrote: Given that these charts are pretty accurate, this indicates that whatever the "ISS" is, it's altitude is at least a few hundred kilometers and probably exactly the claimed altitude (a little over 400km). What about the temperature of the thermosphere at those altitudes? That thing should be fried at least. Well I don't believe for a minute there is actually anyone living inside of it. But given it's reflectiveness and the angles it is visible from when viewed from different locations on the ground and the rate it appears to move, there seems no way to avoid the conclusion that something shiny is up there travelling around 27,500 km/h at an altitude of around 400 km. As far as what the "shiny" thing looks like, I'm of the opinion that the majority of amateur pictures taken from the ground are legitimately obtained images (though others may certainly disagree). All it takes to do that is a camera attached to a telescope, which is no great obstacle. I'm going to test this myself by using a camera adapter and t-ring mount (these two items together cost less than $50) that allows me to attach my DSLR camera to my telescope. This setup will enable me to eventually get highly magnified images that will show more detail than the tiny point of light seen by the naked eye. If I can't get similar looking images of the thing, I'll know there's a much bigger conspiracy than I previously thought. NotRappaport » October 31st, 2017, 6:33 pm wrote: I'll just switch the camera into video mode a few seconds before it comes into frame. The downside to video mode is it records at a maximum resolution of 1080x1920 (equivalent to about 2 megapixels), whereas picture mode can image at the full 18 megapixels. I have made some new videos about the Iss fake, but in french. *1 -The french Pesquet send us wonderfull pictures in HD of France. So,why there are no video with details of Earth? Really no one. There is a hundred and more, videos from the so called Iss, but so far from earth. Why there is no pictures from some magnificent place, as the Drake Passage between South America and Antarctica? *2 there is a really flagrant anomaly in the size of the soyouz between the beginning and the end of the video. I explain in my video, why this zoom is not possible. People here in France are really angry with my videos, they threaten me! Even spotting it proves nothing. What if it's actually 1/16th the size they claim it is and 16 times closer? Catching it in a viewfinder only proves that there is "something" up there, that's it. anonjedi2 » November 1st, 2017, 10:45 pm wrote: Even spotting it proves nothing. What if it's actually 1/16th the size they claim it is and 16 times closer? It couldn't be anywhere near that close because all the visibility charts and positions given by sites like Heavens Above and ISS Astro Viewer would be completely wrong and useless for locating it. But by all accounts those sites are extremely accurate. At 1/16th the altitude it would be less than 26 km high. At 26 km it could only be seen for a radius of about 147 kilometers - any further away and it would be less than 10° above the horizon. 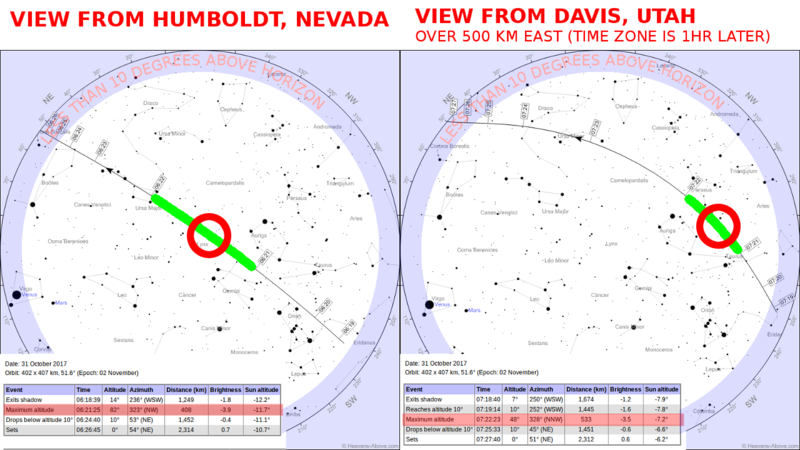 Here is an image showing the "ISS" visibility charts at the same time for two locations: Humboldt County, Nevada (40.9834°N, 117.6572°W) and Davis County, Utah (40.8484°N, 111.8372°W). These locations are on approximately the same latitude, but are separated by over 6° longitude which works out to around 645 km apart (but I just put "over 500 km" in the image). They are also in different time zones - Utah (MST) is 1 hour later than Nevada (PST) - so 6:21 in Nevada is the same time as 7:21 in Utah. As we can see, right around 6:21:25 the ISS is almost directly overhead in Humboldt, and at the same time still between 30 and 40° above the horizon in Davis. EDIT: I've added red circles to show where this time is along the ISS path path and made the part of the path between 6:21 and 6:22 (PST) green in both charts. The only way for this to happen is if it is over 400 km in altitude. There seems no way to avoid the conclusion that something shiny is up there travelling around 27,500 km/h at an altitude of around 400 km. For one thing, we know that jet airplanes need air to be able to fly. They just won't fly in the absence of air. At a certain altitude, a jet plane will be starved of air - and both its engine and wings will cease to function. The plane will eventually stall catastrophically - and plummet back to Earth. There's no way, for instance, for a modern-day F-18 fighter to just point upwards and reach the Kàrmàn line - considered to be (at 100km of altitude) the threshold between our atmosphere and outer space. When studying aeronautics and astronautics in the 1950s, Kármán calculated that above an altitude of roughly 100 km (62 mi), a vehicle would have to fly faster than orbital velocity in order to derive sufficient aerodynamic lift from the atmosphere to support itself. At this altitude, the air density is about 1/2200000 the density on the surface. For an airplane that is trying to fly higher and higher, the thinning air gives less and less lift, requiring a higher speed to create enough lift to hold the airplane up. There comes an altitude where it needs to fly so fast to generate lift that it reaches orbital velocity. The concept of the Kármán line is the altitude where the flying speed necessary to aerodynamically support the full weight of the airplane would be equal to orbital velocity (assuming the wing loading of a typical airplane). So, the ISS is some sort of visible and photographable refuelable vehicle which does at 405 km altitude what is impossible at a mere 100 km, skirting along at no less than 27,580 km/h, never deviating from schedule by a minute, yet is per definition not in orbit. An infallible hyper-supersonic perpetuum mobile. Ionosphere or no ionosphere, aircraft flying parallel to the earth require both lift and rear thrust, not just vertical boosts to stay aloft. Engines (at least the ones I know) need fuel and oxygen, not ions. Refueling at 27,580 km/h sounds highly counterintuitive to me. Or do solar panels generate power enough to sustain "escape velocity"? NotRappaport wrote: Even at 400km there is enough atmosphere to cause drag (and, helpfully, still enough atmosphere for rockets to work). What makes you so sure rockets work at 400 km altitude? However, googling around it's surprising the number of contradicting explanations. For some, the ISS has its own boosters and fuel. Others say that the supply modules give the ISS a kick upwards when coupled. But all in all, its official mass is about 500 tons. Well, you'd need an enormous amount of fuel to push it up even a little bit... To be correct, it's not "elevating", but rather adding speed so the orbit gets higher. And we have to believe this has been done since 1998? Flabbergasted » November 2nd, 2017, 10:29 am wrote: Ionosphere or no ionosphere, aircraft flying parallel to the earth require both lift and rear thrust, not just vertical boosts to stay aloft. Engines (at least the ones I know) need fuel and oxygen, not ions. Refueling at 27,580 km/h sounds highly counterintuitive to me. Or do solar panels generate power enough to sustain "escape velocity"? If you can achieve a velocity such that the earth below you curves away from your trajectory at the same rate gravity pulls you down, you would theoretically stay at the same altitude forever (orbit). This won't sustain if there is drag - and while there is drag in the ionosphere there is definitely not enough air to create any meaningful lift, at least not without wings that are many kilometers across (and certainly not on an albatross shaped like the "ISS"). Basically the drag force is constantly slowing the thing down so it's speed is always falling below what is necessary for orbit. The altitude charts show that it's engines are not able to simply counteract this and maintain a true orbital trajectory, but instead it is constantly falling and being boosted back up by a few hundred meters or so with accelerations on a daily basis, and even then the trend is falling so it requires significant sustained accelerations to increase its altitude by ~1km about every month. I would assume refuelling is the true purpose of the regular "Soyuz" visits (it certainly isn't to restock it with gorilla costumes and candy bars for the asstronots). The solar panels are there, I presume, to supply it with enough power for the transponders and remote controls to work. Although its also possible they are only there for show (or even serve another purpose entirely) and the thing may actually use only batteries for it's electronic relay functions. As long as there is any atmosphere at all rockets can expel gases to create increased pressure at the nozzle which will push against said nozzle and the rocket. Just by the presence of some miniscule atmosphere (sufficient to cause drag) it follows that they will work, albeit at highly reduced efficiency. Rockets would only need to generate a small amount of thrust to produce the gradual ascents apparent in the jagged lines of it's altitude charts. Now it might be possible that there is some way to generate movement by or harvest fuel from the charged ions and free electrons that are plentiful in the ionosphere, but this would require imagining hitherto unknown technologies that don't seem necessary to explain the thing. Altair » November 2nd, 2017, 11:03 am wrote: But all in all, its official mass is about 500 tons. Well, you'd need an enormous amount of fuel to push it up even a little bit... To be correct, it's not "elevating", but rather adding speed so the orbit gets higher. And we have to believe this has been done since 1998? You are right about the "adding speed" vs "elevating", I didn't phrase that correctly. Size, distance, and velocity can all be verified by observations from the ground, but its mass cannot so I do not believe the thing weighs anywhere near it's "official" weight of some 500 tons. Perhaps this is a good time to chime in about some alternative explanations of the floaters we see. There is an entire paradigm of scientific understanding and corresponding technologies built upon this understanding which is hidden away from the public, but yet there are still fragments of its formative years still available for any willing thinker to consider. One of the central concepts of this paradigm is called implosion. We see this phenomenon at play in Nature through hurricanes, and tornados as two overt examples. This phenomenon is related to why trees can get their sap to rise far higher than what would be possible through pressure and osmosis alone, and it is even related to how our blood flows through our veins since the heart is not really a pump as we are told. I do not think it would be appropriate for me to go deeper into explaining this concept on this thread, but I have brought this idea forth in order to instill fresh life into this discussion which is falling into a stalemate of impossible narratives. The floaters that we see may very well be utilizing technologies based on implosion. That is at least my leading hypothesis at the moment. The_White_Lodge » November 2nd, 2017, 12:24 pm wrote: One of the central concepts of this paradigm is called implosion. ... this phenomenon is related to why trees can get their sap to rise far higher than what would be possible through pressure and osmosis alone, and it is even related to how our blood flows through our veins since the heart is not really a pump as we are told. I believe that is called "capillary action", which has no relation to implosion as far as I can see. Definitely seems off-topic for this thread. Alright, I will say no more about it for now, but for the idea that this object is being periodically "reboosted" via propulsion to be taken seriously was a clear indication that this discussion was in dire need of alternative possibilities. The TRUTH About "Vomit Comets"
Simulating the effects of zero-g is most realistically accomplished by filming the participants inside of a “reduced gravity aircraft” - colloquially known as a “vomit comet” - which, as we've all heard ad nauseum, can only produce approximately 25 second periods of freefall "weightlessness". During such parabolic flight an aircraft flies a trajectory that provides freefall for up to 40 seconds. Where T is the time of flight in seconds, v0 is the velocity at the start of the parabola in meters per second, a is the parabolic launch angle, and g is the gravitational acceleration in meters per second (9.8). So as we can see the limiting factor on how long freefall can be obtained is aircraft speed (edit: they can also use a steeper launch angle, but that's risky). The clunky old C9-B only travels at around Mach 0.8 and so will only get up to 40 seconds of freefall, BUT there are much faster aircraft than that! Something that travels as fast as the Concorde (Mach 2) could get almost 99 seconds of freefall! Documentation on the vomit comet is absolutely loathe to tell anyone about the parabolic time of flight formula upon which the flight maneuver relies to produce it's weightlessness. Because they realize that then people might calculate for themselves just how long an artificially generated weightless sequence could last! I think your calculations are correct, but this argument is probably the weaker one over claiming that they are merely slicing scenes together using the more conventional aircraft speeds and 40 second free-fall times. I am not saying this on mere intuition, but based on the work of music industry puppets OK GO who produce all sorts of disassociated fanfare. In particular, there is a video of theirs called "Upside Down Inside Out" which features this "zero G" effect. I refuse to promote such a thing by linking it here, but I encourage you to look into it and perhaps even some of the "how it was made" videos and articles about it. I think you will find that these will be a basic giveaway of most of NASA's techniques. I selected that particular sequence precisely because there are no slices or edits. Edits in such a dated video sequence as Apollo 10 would be very easy to spot, so if you think they are there please give timestamps between 57:06 and 58:06 to indicate where they are located. The minute-long sequence in the Apollo 10 video I linked is clearly not edited, which proves they have indeed been using parabolic maneuvers that far exceed the "25 second" and even the "40 second" claim. Those who believe such time limits are true will flounder for legitimate explanations for this footage, and will be forced to either resort to nonsense or else be tricked into into believing they were really in "orbit". This is why I felt it important to bring up the facts about the duration of weightlessness which can truly be obtained from parabolic flight maneuvers and also to describe the math behind it - the "parabolic time of flight" formula. Even Wickedpedia does not reveal this aspect of the parabolic maneuver. Mach 2 (the speed of the Concorde): 99 seconds of freefall! Most modern-day productions purporting to be "space videos" aboard the "ISS" use more computer-driven methods of deception like chroma-key and wire harneses. Such techniques have been around since the early days of Hollywood and the use of modern computer-aided chroma-keying techniques with wire harnesses is no secret. There are companies like "ZFX Flying" that specialize in just such effects. Combine this with the use of CGI-inserted "props" such as floating microphones, flutes, water drops, hair, etc and you have everything needed to produce 99% of "on board the space station" videos. These techniques are *almost* as good as what can be obtained by the parabolic flights (which produce what is, for all intents and purposes, "real" weightlessness). I say "almost as good" because those of us with a discerning eye and familiarity with misdirection techniques can figure out what is really happening. This is why NASA (and other space agencies) still keep the parabolic maneuver in their bag of tricks for occasional use, all the while keeping the people believing the lie that parabolic flights can't possibly get more than a 25 second sequence of weightlessness.